So, today I am going to report on days 8, 9, 10, and 11 of the TdF which correspond to stages 8, 9, and 10 of the Tour de France. Day 10 was a rest day–no racing for the cyclists–so from here on out, the days and stages will have different numbers. On Day 8/Stage 8, I finished spinning the Black Pillar singles. I still haven’t plied them. 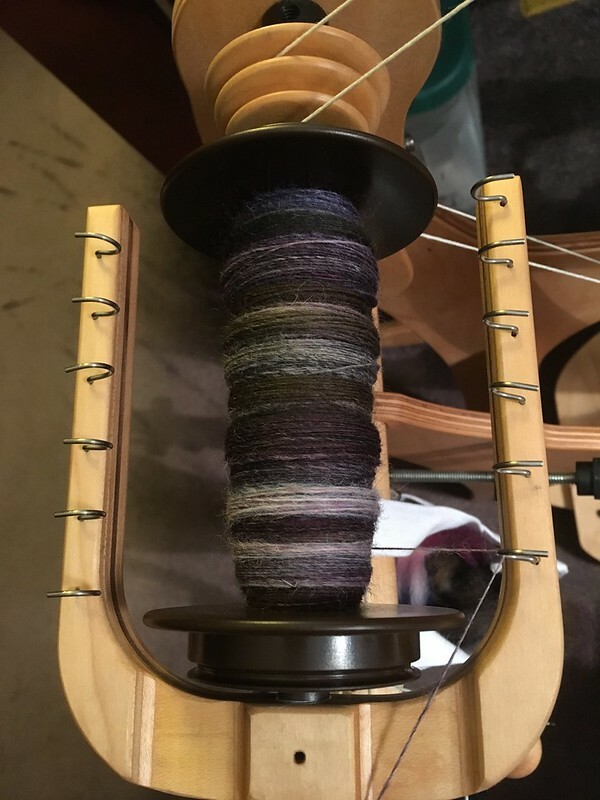 On Day 9/Stage 9, I plied all the singles I had spun so far, except for Black Pillar, and I also plied some singles that I had spun during the Stanley Cup playoffs. 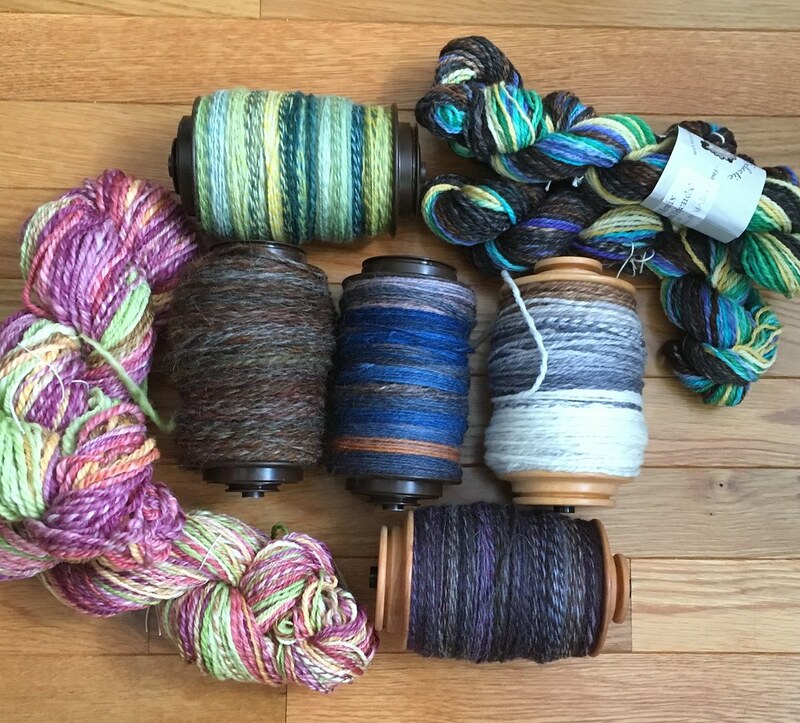 Top l to r: Aspens, Feathered Friend Far left: Out of Season (spun during the Stanley Cup playoffs) Middle, l to r: Squirrel, Little Bluebird, Caribou Bottom: The Undead All fibers by Spunky Eclectic. Monday, Day 10, was a rest day, and this year I actually took a break from spinning on the first rest day. But that doesn’t mean I was idle. I spent some time preparing fiber for spinning. Yesterday, Day 11, Stage 10, was a challenge day, so I spun a new-to-me fiber blend, Merino/yak. Both fibers have a short staple and are very soft. I was expecting it to be a bit difficult to spin, but it actually was pretty easy. The color way is Game Birds from Spunky Eclectic, a CLUB Remix selection from 2015. 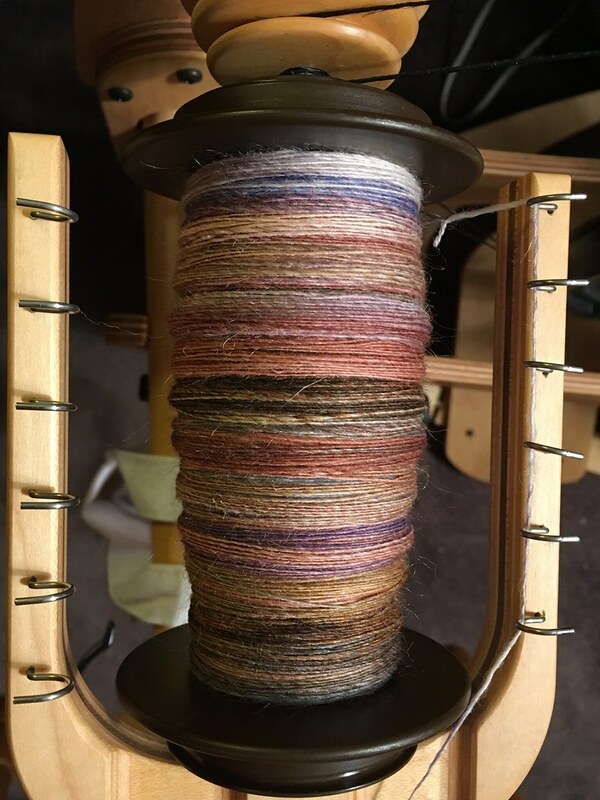 All the plying was done in Scotch tension on my Schacht Ladybug except for Squirrel, which was both spun and plied in Scotch tension on my Schacht Flatiron. Today I will be spinning again. I am going to start on a 2016 Spunky Club selection and spin both bumps. That’s ~8 ounces of fiber, so I probably won’t get it all spun today, but I should make a dent in it. I’ll will post pictures tomorrow. 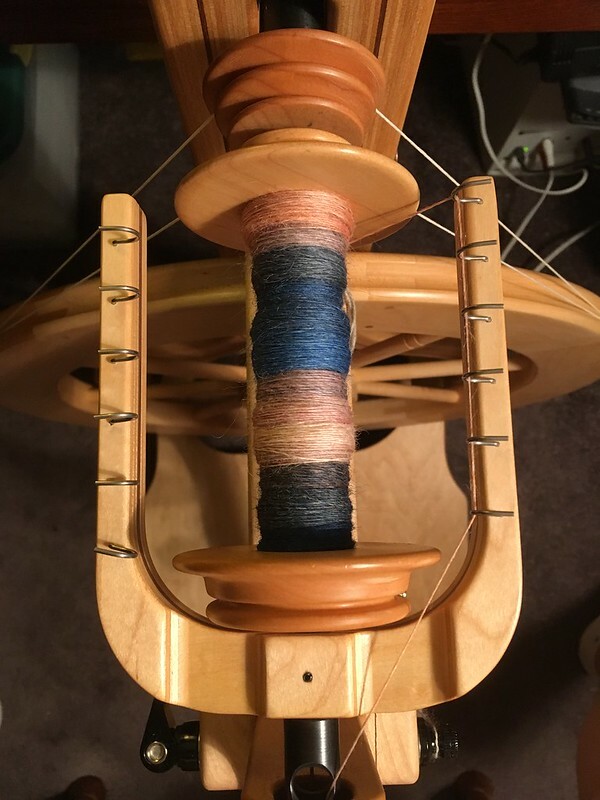 More spinning! 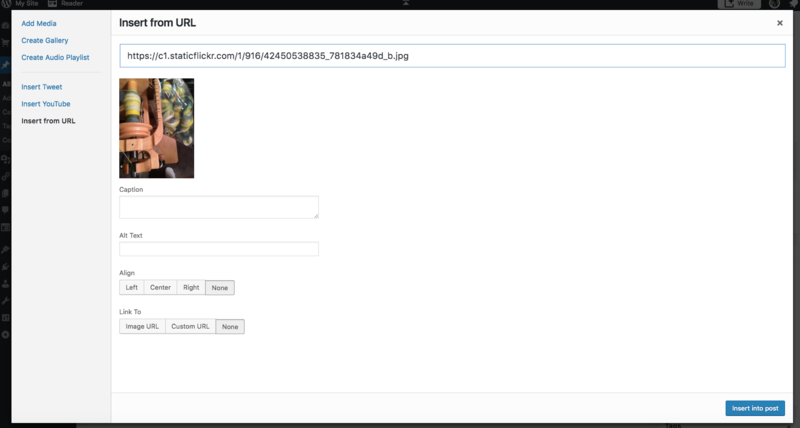 And with any luck, I will remember how to insert pictures from Flickr and add captions. 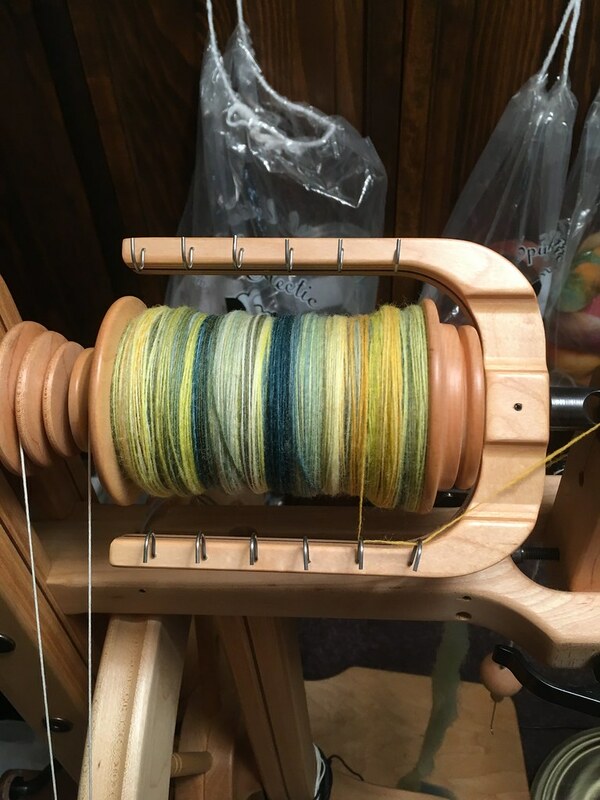 The singles spun from the Farmer’s BFL from Spunky Eclectic in the color way Aspen were almost but not quite finished on Day 6/Stage 6. I finished the Aspens singles on Friday, Day 7/Stage 7 of the TdF. I still haven’t decided how I’m going to ply these, but I’m leaning toward a 2-ply from a center pull ball at the moment. Day 7/Stage 7 This is the last of the second bumps from my Spunky Club, this one from March 2016. 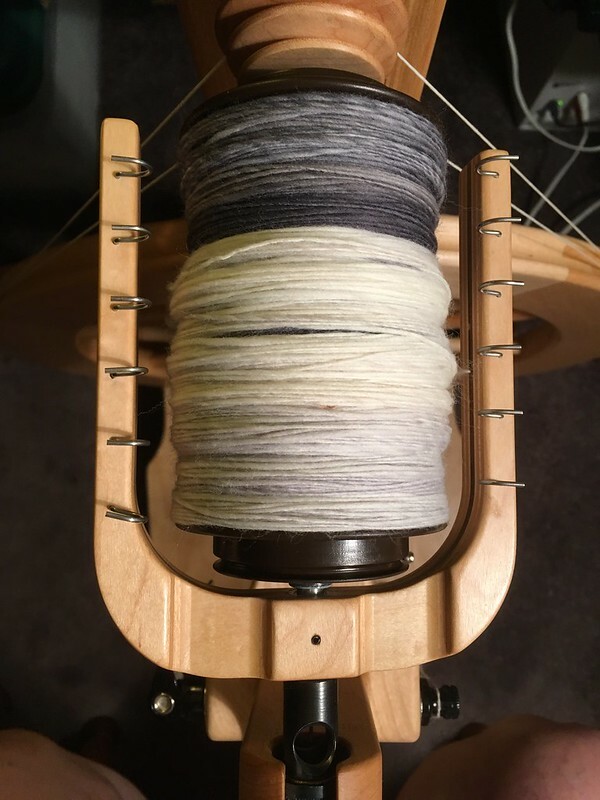 The color way is Black Pillar and the fiber is Po-Mo-Silk, a blend of Polwarth, mohair, and silk. It’s lovely to spin and loves to be spun very thin. I might get the singles finished on Day 8. My Matchless has been getting a workout so far, but my Flatiron isn’t being neglected. 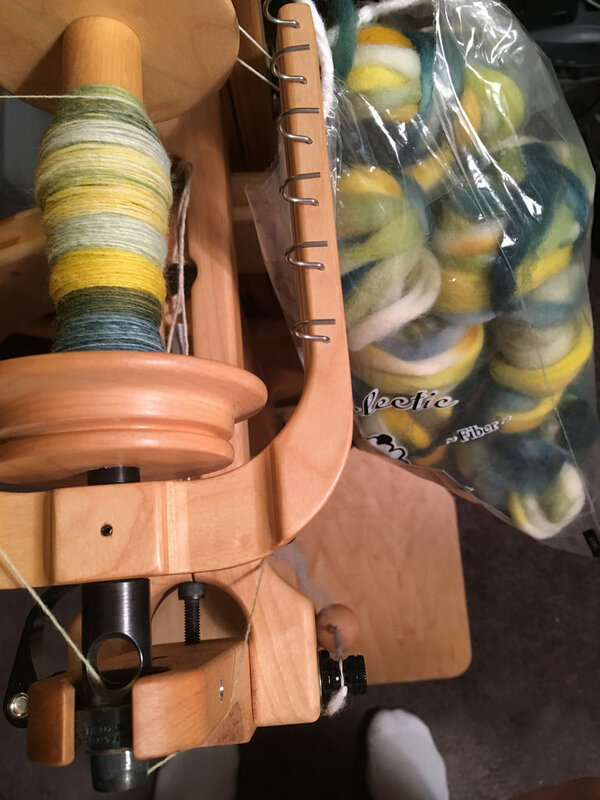 I’m spinning Black Pillar on the Flatiron in double drive using the smaller pulley on the fast whorl (17.4:1). If you look closely, you will see that my drive band is black. I’m trying out a new to me type of drive band based on recommendations on the Schacht forum on Ravelry. It’s hemp, and the first time I used this drive band, I wasn’t thrilled with it. But I decided to try it for this project, and so far I really love it. I am getting a steady but soft take-up without any backspin and with light treadling. 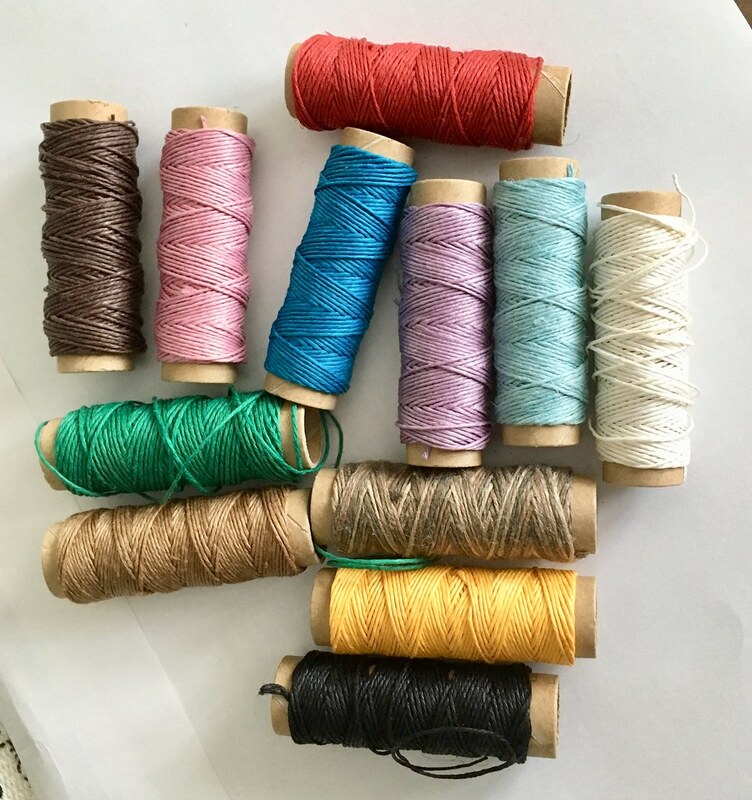 The Hemptique 10# hemp cord that I bought comes in a boatload of different colors, including some variegated, and I couldn’t decide on a single color, so I bought a variety pack that has a dozen different colors on small spools. Each spool is enough for 2-3 drive bands (depending on the size of the drive wheel). I don’t think the hemp cord will replace the 8/4 cotton rug warp (seine twine) that I love (and that also comes in a boatload of different colors), but I will definitely be using it in addition to the rug warp. 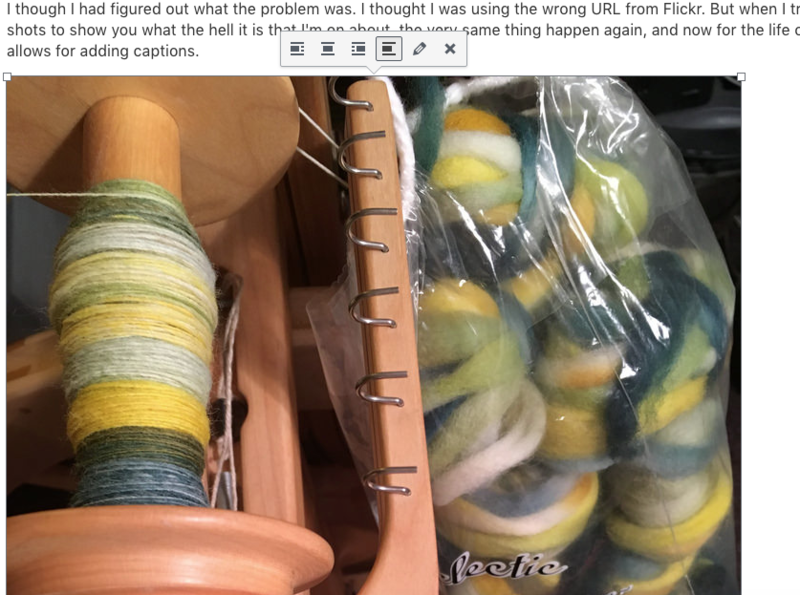 I got a fair amount of spinning done yesterday, which was Day 5/Stage 5 of the TdF, but my frustration with WordPress continues. Before yesterday, I was able to upload pictures to my blog post from Flickr and add captions and such, but for some reason I can no longer do that. 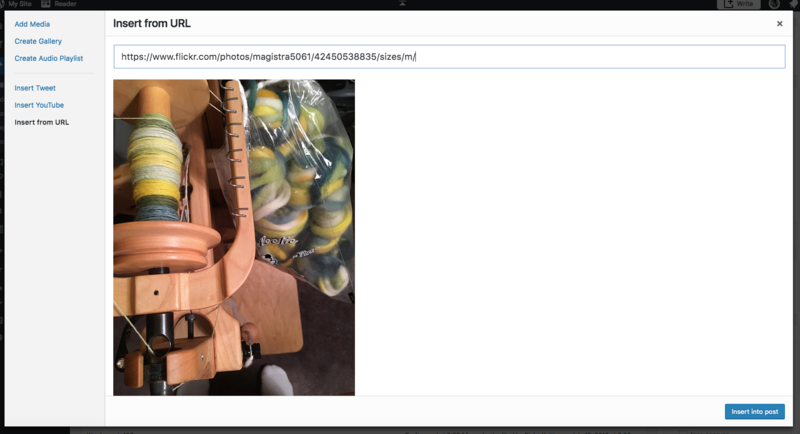 Although there is a button for editing a picture, when I press it, it takes me to a page that has the picture but none of the boxes for adding a caption, centering the picture, etc. Perhaps I just don’t know the magic formula for making that stuff appear, but I have to say that it is spoiling my blogging experience and may well put an end to my already spotty blogging, not that anyone would miss my blog. Anyway, I ended up uploading the pictures from Flickr to WordPress just so that I can put captions on the pictures. I will probably use a certain search engine to try to figure out what’s going on with WordPress and why what worked just a couple of days ago no longer works. Gotta love technology. I’m spinning this fiber in double drive on my Matchless, which I am falling in love with again. Spunky Eclectic Aspens which I divided lengthwise into very thin strips. I’m spinning it end to end and it’s going very nicely. I will probably do a two-ply from both ends of a center-pull ball, but I am also considering chain plying to make a self-striping yarn. When I spun the other bump of this fiber, I didn’t much enjoy it because it was very difficult to draft. But stripping the fiber and predrafting it has made a world of difference and I am enjoying this spin a lot. I finished up the singles for this project, also in double drive on my Matchless. Spunky Eclectic Romney in the Little Bluebird colorway, another second bump from a Spunky Club selection. I divided this fiber up for a fractal 2-ply plied from both ends of a center-pull ball, and now the singles are resting before I ply them. 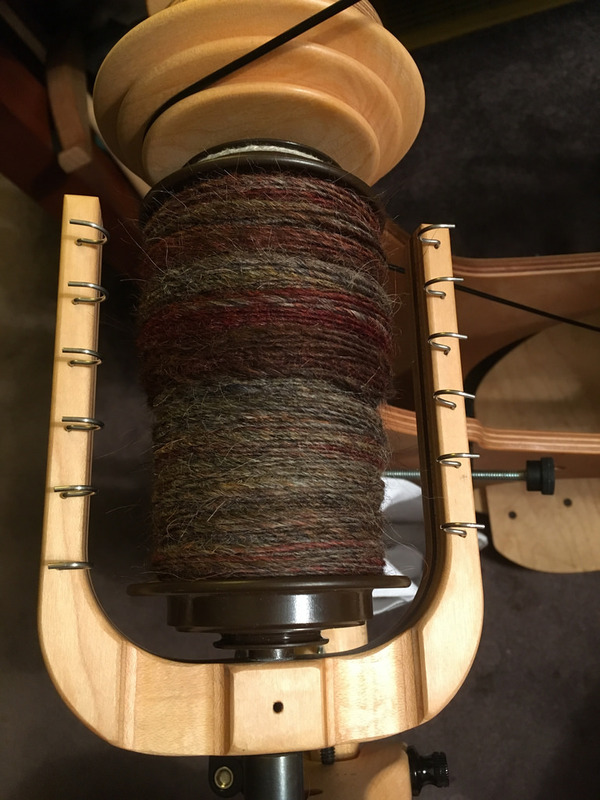 Finally, yet another “second bump,” this time Icelandic wool from Spunky Eclectic in the Squirrel colorway, spun in Scotch tension on my Flatiron using the slow whorl. This fiber is best spun with low twist or else it feels like twine. The singles are done and awaiting plying. 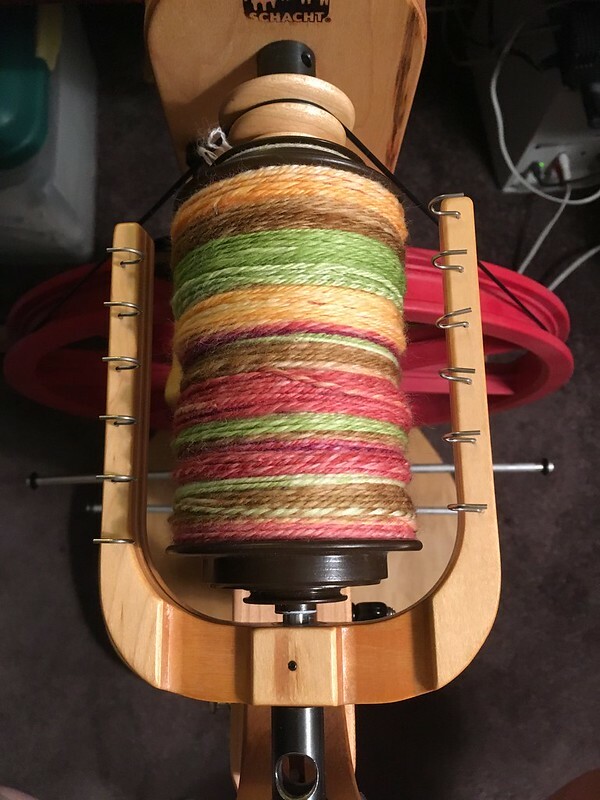 I will use my favorite method of making a 2-ply yarn, winding the singles into a center-pull ball (actually a”cake”) and plying from both ends. With this method there is never any left-over singles. 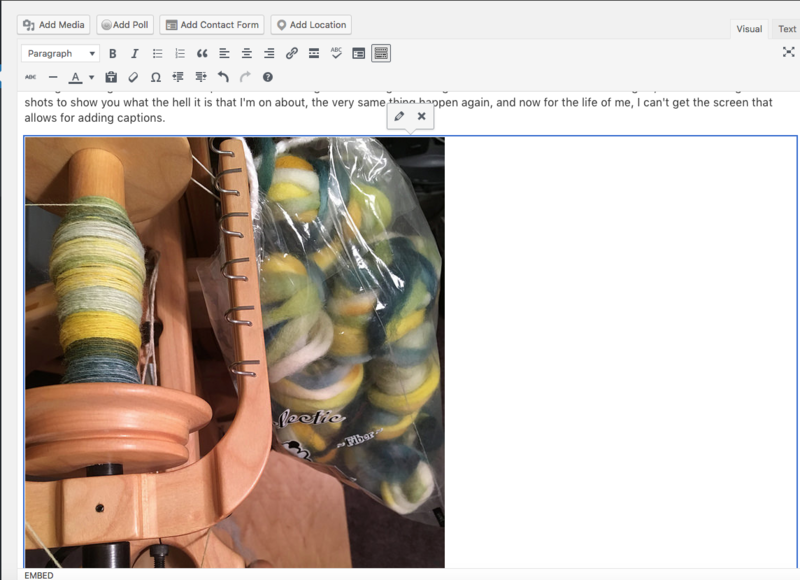 For some reason, WordPress won’t let me caption or otherwise edit the pictures, so I will put the text describing each bobbin before the picture. These are the finished singles of Spunky Eclectic Caribou (progression dyed) on superwash Targhee. 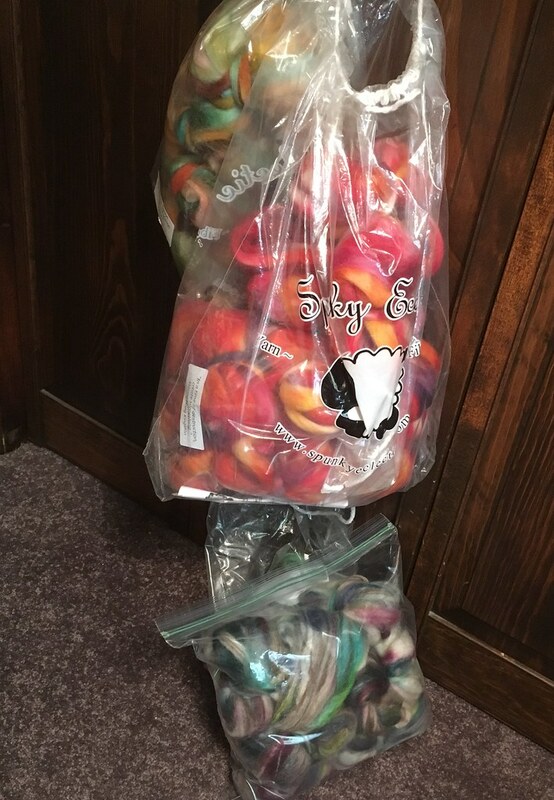 They will be chain plied to make a self-striping yarn with big chunks of color. Below is Feathered Friends, also Spunky Eclectic, all chain plied and ready to be wound off onto the niddy noddy. The next two are yarns that I spun during the Stanley Cup playoffs but chain plied yesterday during the TdF. The fiber is a progression dyed superwash Merino from Spunky Eclectic called Out of Season. 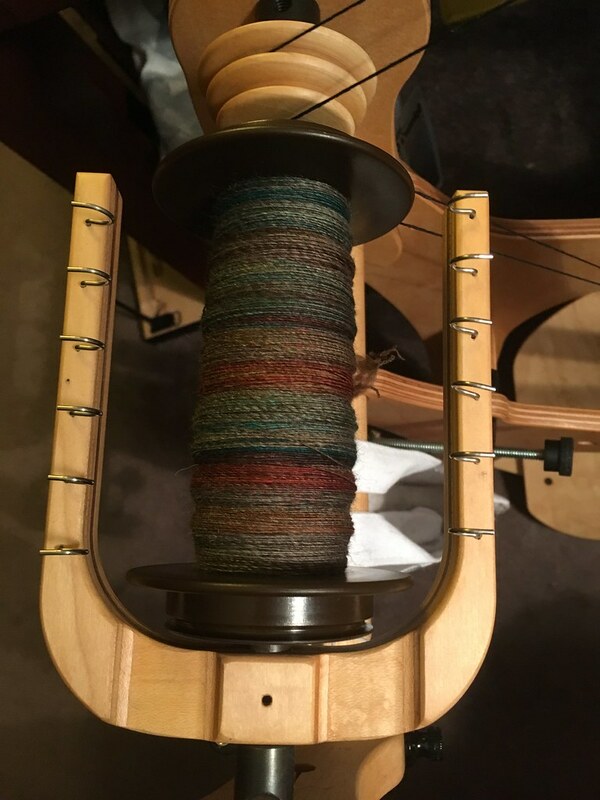 I spun the top bump end to end to keep the progression intact; the bottom bump was split into multiple strips lengthwise to make a self-striping yarn. Finally, I started spinning up the second bump of Little Bluebird on Romney, also a fiber from Spunky Eclectic. I am doing a two-ply fractal. 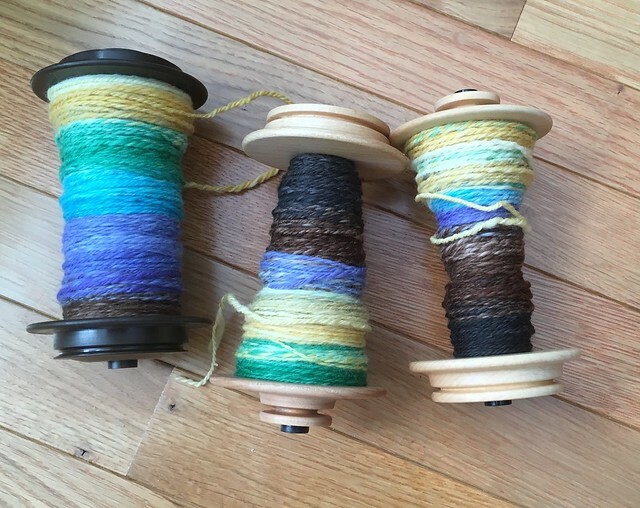 I will spin the yarn onto one bobbin, then wind into a cake and ply from both ends which is now my favorite way of doing a 2-ply because I never end up with extra singles. 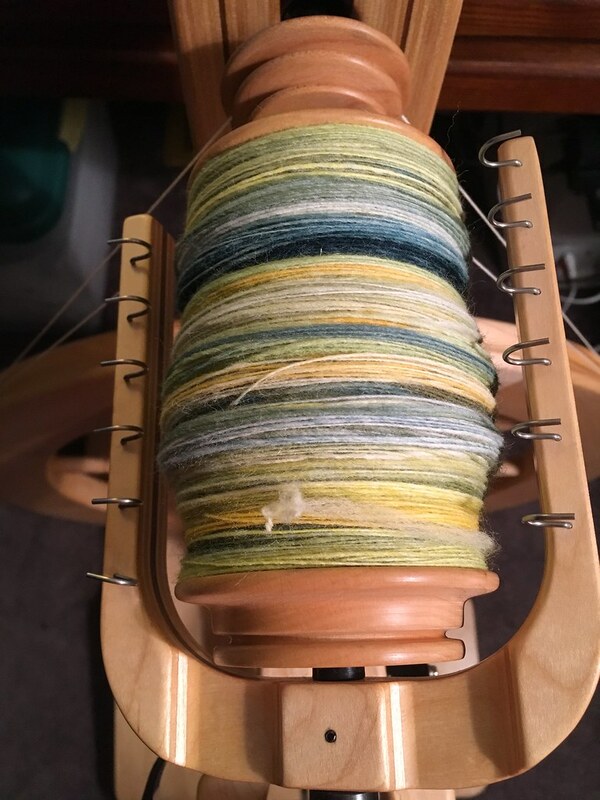 I spun this braid of superwash Merino from Spunky Eclectic in the color way Feathered Friends from the 2015 CLUB Remix. The two small strips are at the top, the larger strip at the bottom. and I will chain ply the singles to create three skeins of yarn to make a hat (the larger strip) and matching fingerless mitts (the small strips). I hope that dividing and spinning the fiber as I did will result in stripes that will be about the same size in both the hat and the mitts. We’ll see. The knitting is a ways down the road still. 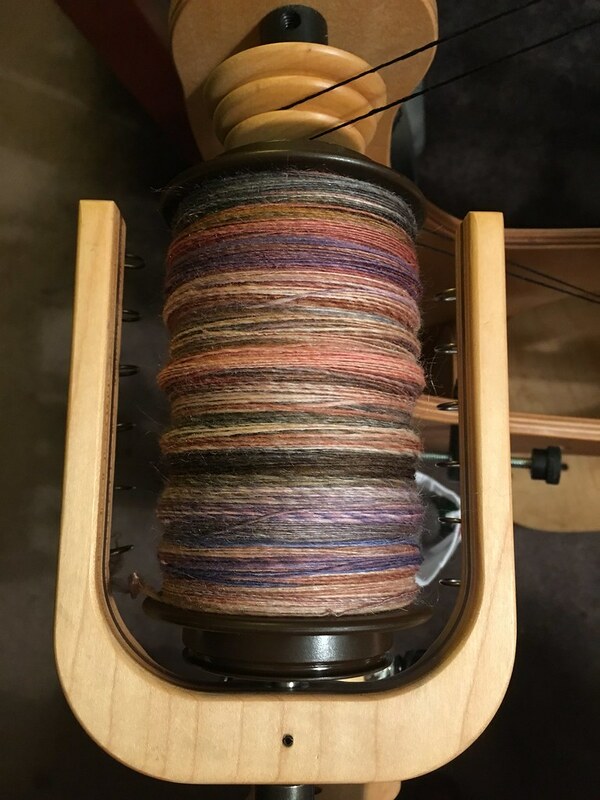 I also started the second project of the 2018 TdF which I’m spinning on my Schacht Flatiron. It, too, is a Spunky Eclectic CLUB Remix from 2018, a braid of Cheviot in the color way The Undead. 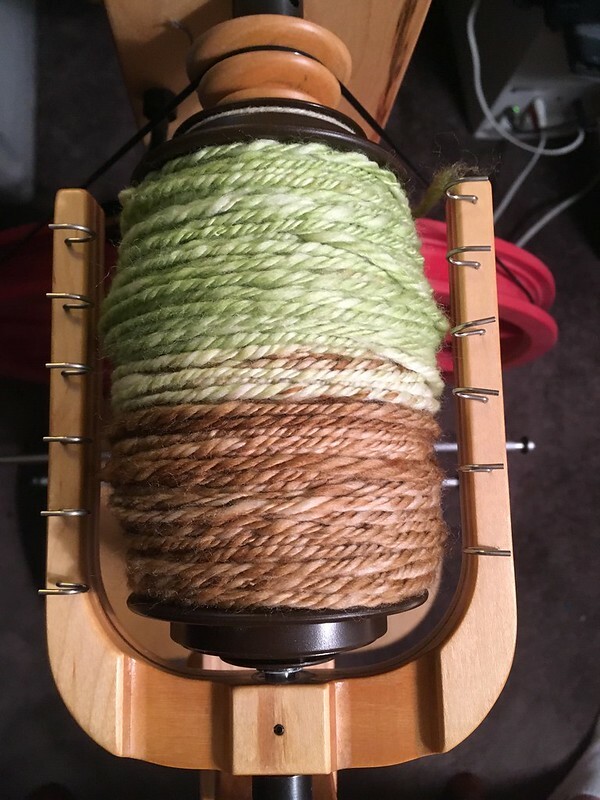 When I received this fiber, I had a hard time imagining how it would look when spun. I decided to strip the bump lengthwise into very thin strips, spin them end to end, and then either chain ply the singles or ply from both ends of a center-pull ball. 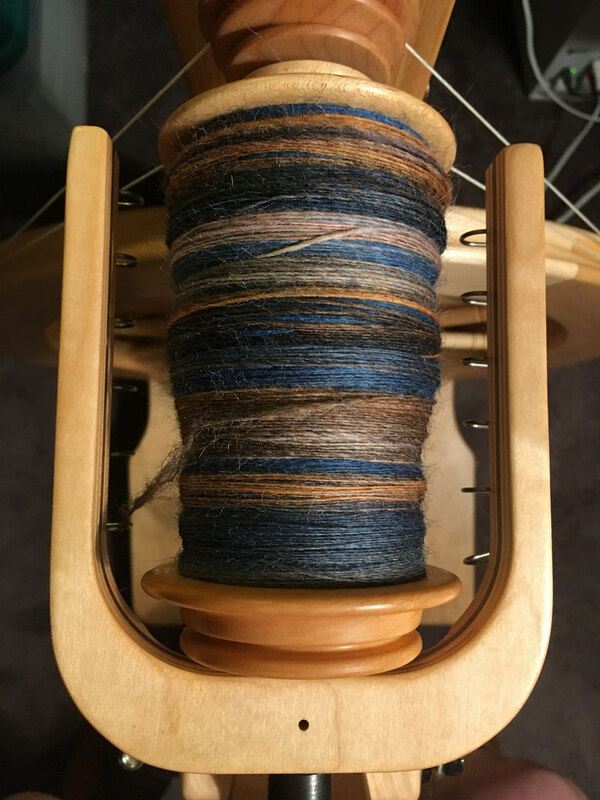 I still haven’t decided how I want to ply the singles, but I do know that I love how the fiber looks when spun. 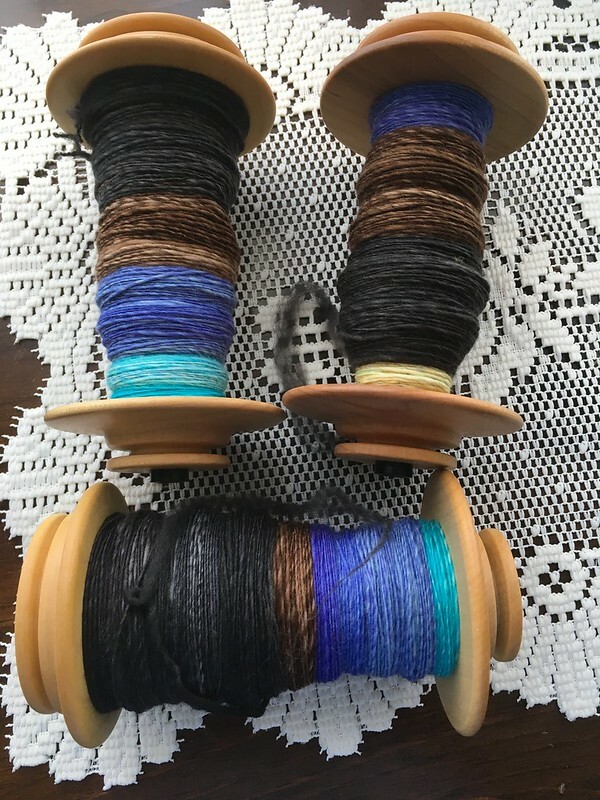 I’m leaning toward chain plying these singles because I love the contrast of the dark and light. Today I hope to finish spinning “The Undead” and maybe even start a third project or do some plying. I love the Tour de Fleece.